Why is recycling important for your business? Economic considerations and the need to streamline apply pressure on businesses across all sectors. However, this is not the only priority for mindful modern management. Corporate social responsibility is a theme for 2017 – and beyond – and that means making changes to a business to make it more sustainable and creating social, economic and environmental benefits for stakeholders. Key to this is taking responsibility for your business waste and choosing to dispose of it ethically. On the whole we are a wasteful society, generating 200+ million metric tonnes of waste each year. Stop and think for a moment about the volume of paper your business uses on a daily basis – and then imagine the difference you could make if all that paper was recycled, rather than thrown out as waste. This is just one way to demonstrate corporate social responsibility but a very powerful way. Recycling not only helps to reduce our reliance on unsustainable resources but it also saves energy, as it’s far more energy efficient to create products from recycled materials than from raw materials. Recycling is not only a great way to demonstrate corporate social responsibility in business but has a wider positive impact on the world around us. Reducing the energy used in production processes helps to decrease release of fossil fuels. These produce emissions when burned that are directly responsible for the kind of global warming and extreme weather attributed to the Greenhouse Effect. Crucially, recycling also helps to minimise the volume of landfill that we create, which has a knock on effect of reducing explosive and polluting landfill gas. All commercial enterprises have a duty to try to minimise waste and take all opportunities to prevent, reuse, recycle or recover waste. A clear and easy to follow recycling policy lays the foundation for a company that is ethically sound and focused on efficient but responsible business. Ethically, recycling is the obvious choice over sending vast volumes of waste to landfill. Consumer attitudes are now much more switched on to supporting those businesses that take responsibility for their corporate actions, which makes recycling great PR and a way of reassuring customers of good intentions, as well as setting yourself apart from the competition. Being able to demonstrate a sound recycling policy is great PR – and, conversely, the lack of one can do great damage. In the modern marketing age, thanks to social media and smart phones, creating and destroying reputations lies often in the hands of the public and a lack of corporate social responsibility is easily exposed and exploited. A sustainable business model is a unique selling point and a foundation on which to build positive relationships with both current and future customers. Recycling is key to a sustainable approach – in fact, you can’t create one without it. It can help businesses to save money, as well as boosting those green credentials and making a positive difference to the environment. In the context of current consumer attitudes and world needs it’s an obvious choice. 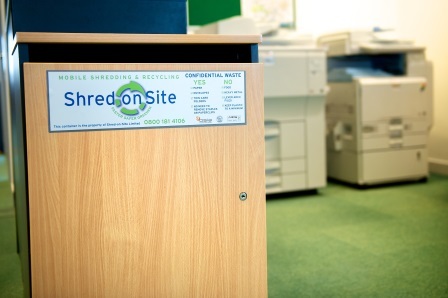 Did you know that Shred-on-Site recycle all your shredded paper after it’s been shredded? This ensures the most eco-friendly and secure solution for your shredding. Get in touch with Shred-on-Site to discuss your requirements today on 0800 181 4106.